Trinity Mirror’s regional daily websites claimed the top three places for year-on-year growth in the latest ABC Figures. 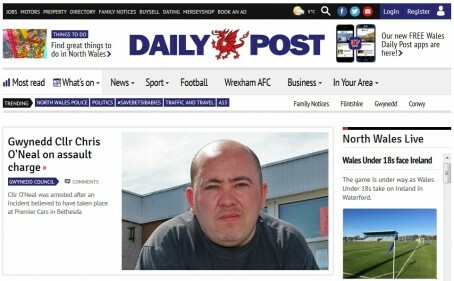 The North Wales Daily Post, Liverpool Echo and Wales Online posted the largest increase in daily average unique browsers in the second half of 2015, compared with the same period the previous year. The Daily Post averaged 77,177 unique browsers, representing an 82.3pc rise, while the Echo showed a 59.6pc increase with 422,360. The Lancashire Evening Post’s website was the highest-placed Johnston Press companion site, with 34,146 daily average unique browsers representing a 44.2pc year-on-year increase. Archant’s Norwich Evening News and Newsquest-owned Glasgow daily the Evening Times earned themselves fifth and sixth positions in the table, with increase of 42.9pc for the former and 41.4pc for the latter. However, the Evening Times’s sister daily The Herald, Glasgow, whose website features a metered paywall, saw a 17.2pc decline in daily average unique browsers. The Herald was one of only two regional daily websites to experience year-on-year decline, with The Scotsman seeing a 48pc fall. However, owner Johnston Press says the decline is down to its figures previously being reported together with those of the Edinburgh Evening News. The two title’s figures are now submitted separately. Overall, Trinity Mirror’s regional network recorded the highest number of daily unique browsers with 1,966,267 – a 40.1pc rise. Local World sites experienced a 19.7pc increase, with Newsquest at 16.7pc an Johnston Press at 9.5pc also experiencing rises. The Bristol Post was the best performing Local World website, with a 97,261 average representing a 37.7pc increase. Which translates to what in terms of paying bills? Christopher Gage asks the only question worth asking. All of these organisations are businesses existing to make money. So where’s the money in the above lists? Is TM Regionals the place to be – full of well-rewarded operatives, secure in their jobs, reaping rises and bonuses? And if it isn’t what do these numbers mean? So with these seemingly unbelievable figures, coupled with equally dramatic declines in print, why don’t they go digital only? The answer is because they’re still not making any real money. And the web traffic is super inflated by clickbait Facebook postings, usually sub Daily Star standard – which attract comments in their million by morons. BTW The whole business of allowing comments on live court cases is perhaps the biggest shame of our regional press. 1- what does this mean in revenue terms to the business? Please could Archant publish the viewing figures for ( tries not to laugh) Mustard tv? Boast. Boast. Boast. But no money figures. I think we have seen all this before and know what it means. If these stats are valued by the main regional press group bean counters who are running things these days,will they be bold enough to convert all their ailing newsprint products to online only? It would cut huge costs and overheads in one fell swoop which must be a good thing? Paper sales are falling through the floor yet page impressions and unique browsers are on the increase, surely that’s the answer to the problem of cutting costs and growing digital isn’t it? The only slight issue is these UB numbers are useless to a business as there’s no revenue attached to them,It’s purely an indication of who’s taking a look in the shop window for free but not paying for anything. until someone monetises their online news sites the free lookers will increase while those choosing to pay will decline, it’s just not something I would be keen to shout about if I were them. Surely everything – ad sales, circulation numbers, digital figures etc – needs to be considered in the round. Digital figures like these, taken as standalone, surely deserve some congratulations handing out for the hard work that’s gone into achieving them – these websites didn’t just grow by themselves. The Manchester Evening News 550,000 plus unique browsers. Sounds like a fabulous success story until you turn the clock back 40 years when the print circulation peaked at 404,000, and those people had to make the effort to buy the paper! Proof if any were needed that the regional press has failed to keep up with changing demographics, reader habits and lifestyles in modern Britain over those 40 years. A sad case of complacency killing the cat. no business is a charity so meaningless numbers of people looking at a regional press website is irrelevant. with online stats such as pi or uv it simply shows who’s looked not how much money has been achieved as a result and in any business all that matters is revenue. If you’re trying to sell your car are you interested in how many people have looked at it or whether anyone’s bought it? Until someone publishes online revenues against y/y revenues non one will take them seriously and all the hard work that’s gone into it will sadly count for nothing. ABCs don’t directly show how much the ads have been sold for. They’re just as useful (useless?) as figures which show how many page impressions have been made on a website to generate income.